As we all get back to our busy work and family lives, it seems that our memories of the very successful 2016 PWX are beginning to fade, if not just a little bit. However, so as not to be forgotten in the grind of our day to day toiling’s, I wanted to inform our membership that there was a very prestigious individual award presented at the PWX, to one of our longtime members, Mr. Jim Owens. 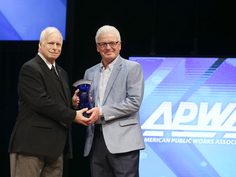 Jim was informed by APWA President Brian Usher, in early June of this year that he had been selected to receive the APWA Presidential Leadership Award for 2016. This is no ordinary award, as it is presented at the sole discretion of the APWA President to individuals who have distinguished themselves in the public works profession and at the national and local levels. Over the past many years, Jim has served on Minnesota Chapter committees as well as national committees, sharing his passion and expertise of the public works profession with those he served with. As I understand it, it was 20 some years ago that Jim first met Brian Usher, as they both served together on one such national committee. As the story goes, after one of their committee meetings concluded, several of the members retired to a local establishment for refreshments, and as the evening progressed, Brian was both entertained and enamored with Jim’s uncanny ability to recall and recite over two hours’ worth of Ole and Lena jokes! Jim’s longtime commitment to the public works profession, his thorough knowledge of the equipment used to perform many of the tasks that public works’ staff is responsible for, and his near eidetic memory for Ole and Lena jokes, all contributed to Jim being selected for this year’s 2016 Presidential Leadership Award. Next time you seem Jim, be sure to congratulate him on a job well done!